The NBA season is upon us. Training camp begins Tuesday for the Trail Blazers. The team's first preseason game is Saturday — that's right, Saturday — against Toronto at Rogers Arena in Vancouver, British Columbia. The annual FanFest intrasquad scrimmage is Sunday night at Moda Center. Portland's regular-season opener is at home on Oct. 18 against LeBron James and the Los Angeles Lakers. That's only three weeks away. • Continuity was a theme for the team through the offseason after its first-round playoff ouster by New Orleans. Eleven players are back from the Blazers' top 14 players, with free agents Ed Davis and Shabazz Napier now with Brooklyn and Pat Connaughton with Milwaukee. "Continuity means everything in the NBA," Blazers reserve Evan Turner says. "To have an understanding of the culture, of what guys do, having assigned roles — that's a plus for us." The entire starting lineup returns — Damian Lillard and CJ McCollum at guard, Jusuf Nurkic at center and Al-Farouq Aminu and Moe Harkless at forward. It's a young group, with Lillard and Aminu at 28, McCollum at 27, Harkless 25 and Nurkic 24. As he enters his seventh season at the helm, Stotts says he spent time thinking during the offseason about the wisdom of change. With coaches who had long runs in the NBA — he mentioned Gregg Popovich in San Antonio and Jerry Sloan in Utah — the questions were always, "How much do you change? How much do you keep things the same?" "You've had success, and you want to keep things fresh, but don't want to reinvent the wheel," Stotts says. "I do want to keep things fresh. Those are things my staff and I are looking at, finding other ways to be successful this season. But I don't see us making wholesale changes." The Blazers haven't had success as has Popovich, or did Sloan, of course. Stotts is 272-220 during the regular season in his six seasons, and Portland is one of five teams to have made the playoffs in each of the last five years (joining Golden State, Houston, San Antonio and Toronto). The Blazers have gone beyond the first round twice, but have never reached the Western Conference finals. They were 49-33 and the No. 3 seed in the West last season — their highest ranking since reaching No. 3 in the lockout-shortened 1999 campaign — but were swept by New Orleans in the first round. • At Media Day a year ago, Olshey, Stotts and several players mentioned a major goal for the 2017-18 season was to make it beyond the first round of the playoffs. No such proclamations were made on Monday. Everyone was reserved in speaking on the subject, perhaps because several teams in the West grew stronger with acquisitions over the summer. National pundits predict Portland to be a middling team. NBA.com forecasts a 42-40 record and 10th place in the West. Vegas has set the team's over/under total for wins at 41.5. "There are probably 12 legitimate playoff-caliber teams in the West," Olshey says. "We all know what the class of the West is (presumably, he means Golden State and Houston), but every other team if they make the playoffs feels they have a very good chance in the first round. Our goal is the same as always — being a factor in the playoffs." "We want to give ourselves a chance in the postseason again," Lillard says. "If we do that in the West, that can be considered successful. It would be easy to miss the playoffs, the way it's going in the West right now." After spending a couple of weeks around his new teammates, though, Seth Curry senses a yearning. "You can tell they're not satisfied with just making the playoffs every year," he says. "They want to make the next jump. They have a chip on their shoulder. The West is tougher this year, but we have a lot of expectations with the team in terms of getting better." • Portland finished tied for seventh in the NBA in defensive rating last season, a major jump up from previous seasons. Stotts says he will maintain the same principles on the defensive end, with some minor tweaks this season. The Blazers were 16th in offensive rating a year ago, a departure from previous years when they have been ranked among the top 10. Added to the roster are four perimeter players — veterans Curry and Nik Stauskas and rookies Gary Trent Jr. and Anfernee Simons — with a purpose in mind, Olshey says. "Everybody we added is a big-time shooter," he says. "That gives us more firepower than will open up the game for 'Dame' and CJ on the perimeter and for 'Nurk' in the post. We started trending toward defensive-minded players who made us more vulnerable on the offensive end." Curry, younger brother of Golden State's Stephen Curry, missed all of last season to a stress reaction of his left leg. The 6-2 combo guard, who averaged 12.8 points and started 42 games for Dallas in 2016-17, had surgery on the leg in February. Curry, 28, started playing five-on-five about two months ago and spent the past two weeks playing pick-up ball with his new teammates at the training facility. "It's the first time I've had an injury where I missed time," Curry says. "It was tough on me, trying to stay engaged. I couldn't shoot or work out at all. I've spent the past month and a half getting back into the rhythm of play." Curry says Stotts' offensive system "fits me well." "It's great for a guard with my type of skill set, who can be on or off the ball and can shoot," Curry says. "I can be the punch off the bench that they need." • The Blazers were 18th in the NBA in 3-point attempts last season, gunning up 28.3 per contest, and tied for 16th in 3-pointers made (10.3) . That will increase this season in an offense that will further emphasize ball and body movement. "We're going to shoot more 3's," Lillard says. "The ball movement is something we've always emphasized. We've always had a lineup where we can shoot the ball, but this year even more, we'll attack by spreading the floor out and making shots." • The Blazers signed Nurkic to a four-year, $48-million contract as a restricted free agent this summer. That made the 7-foot "Bosnian Beast" quite happy. "You know how much I want to be here, with the team we have and how much I need this team and they need me," Nurkic says. "For both sides, it was a good idea to stay. I'm happy to be back." Nurkic understands what he needs to do to earn his keep and be the No. 3 cog in the Blazers' wheel, behind Lillard and McCollum. "Be consistent and know what it takes to play 82 games," Nurkic says. "Experience-wise, (the 2017-18 season) was the best year of my life. It was a good year for me to grow up as a player." Does Nurkic expect to be one of the NBA's dominant big men over the next few seasons? "Of course," he says. "I can be All-Star. I'm going to prove that." • Portland let Davis go to free agency in part to open playing time for 7-footer Zach Collins, the second-year big man who won't turn 21 until November. Collins' defensive rating was first among players who participated in the NBA Summer League, and with his improving offensive game can play either power forward or center. "Zach will eventually grow and fill out into a traditional (center), but he is just a front-court player for us right now," Olshey says. "His versatility and mobility are huge. When you look at the modern-day big man, you're looking for guys who can run the floor, cover ground and rotate on defense." "I don't think Coach (Stotts) wants to put a label on it," Collins says. "I could be a '4' one night, a '5' the next depending on matchups. I think right now 'Nurk' and Meyers will get the majority of minutes at the '5,' but training camp will tell." Stotts says one of the team's "story lines" this season will be how Collins plays without Davis alongside him as a mentor. "Eighty percent of Zach's minutes were with Ed last year," Stotts says. "The challenging thing for Zach is he'll be matched up with different players, whether it's Caleb (Swanigan) or Meyers or Mo or Chief (Aminu). "It will be our responsibility to find out what works best. He'll have a different role, whoever he plays with. There will be an adjustment for him, and I have confidence he'll make that adjustment. He has the ability to play with a lot of guys." Aminu has been Portland's starting '4' the past two seasons, but Collins may be ready to challenge him for the job. Or perhaps Collins will progress enough to challenge Nurkic for a starting role in the pivot. "A starter is something I want to be," Collins says. "I want that to be what my career is like. I think I'm ready for it. I started one game last year. It was a blast. I can't wait to continue that. But however the coach wants me to do it, I'm going to go out there and produce." • Harkless says he will be limited in practice during training camp as he recovers from arthroscopic knee surgery in March. The injury caused him to miss about a month of regular-season action and the first two playoff games. "I won't be doing 100 percent (of the drills) in practice," says Harkless, who didn't reveal a timetable for a return to play. "It has taken awhile to get back on the court and be full speed. It's still something I keep an eye on." That could create an opportunity for Stotts to experiment even more than usual with a combination of units in the preseason, since the rotation — minus key reserves Davis, Connaughton and Napier — will be decidedly different this season. "Who plays with whom is important," the coach says. "Playing combinations will be a big thing. How that works itself out is something everybody will see over the course of the season." • While many of the game's stars are choosing to join forces and put together "super teams" and others are asking for trades, Lillard and McCollum have opted to stay put in Portland and try to build the Blazers from within. 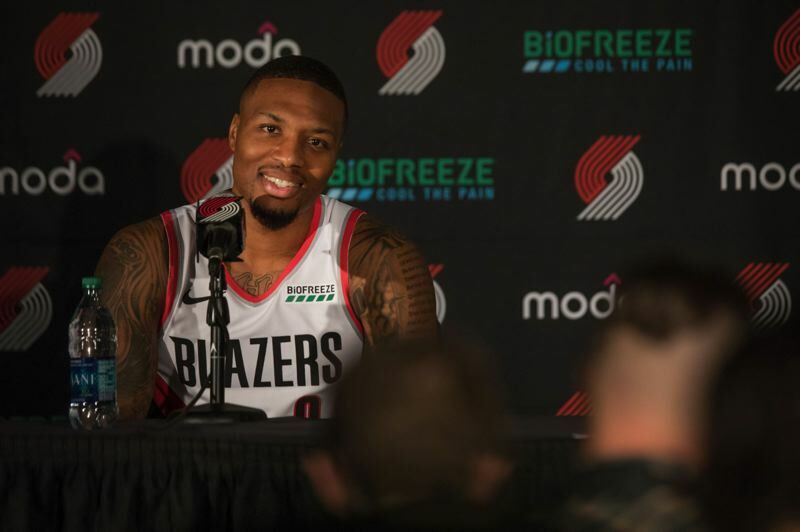 "I've never asked for a trade or been in a position where I wanted (the Blazers) to trade me," Lillard says. "I'm all about the challenge. My family is happy here. I'm happy with my situation here. If the situation were ever to come up where I felt disrespected or like I wasn't valued or they felt like it was time for me to move on, that would be the time. But I don't feel that way." "I'm a loyal person," McCollum says. "That's just how I was raised. You look out for who was taking care of you, or took a chance on you. I'm about figuring out ways to progress and move forward. I bought a house here. I'd like to buy another one. I'd like to raise my kids here, to get married here. It's a stable situation." McCollum says his close relationship with Lillard is unique and single-minded. "There are a lot of teams where the best two players don't hang out or get along, or they disconnect or don't figure out how to have a working relationship," McCollum says. " 'Dame' and I do whatever it takes to win. Our main goal going forward is, 'How can we be great elite players who help our team win?' That's how you're remembered." • Do Lillard and McCollum feel a sense of urgency to get things accomplished on a team level as they enter their peak physical years? "We discuss all of that, figuring out how we can help this team get over the hump, to get better," McCollum says. "Our ages, these are good years where you have some years of service but you're still young. We have to take advantage of these years." • Olshey, too, was asked if he feels a growing sense of urgency to get the Blazers further in the playoffs as he enters his seventh season as the team's president/GM. "We work for (owner) Paul Allen," Olshey says. "There is a growing sense of urgency every day, from game to game, from playoff series to playoffs series, from draft to draft. "We haven't taken steps backward. We've tried to win at every point. It's dangerous, because when you make sure everybody knows you're trying to win, you open yourself up to criticism. If you're building, you're exempt from that microscope the rest of us live under." • Olshey was asked if there is a player who jumps out at him as ready to take his game to another level. "Jake Layman has been terrific," Olshey says. "We all saw how well he played in summer league. He shot the ball at a high level. He is stronger and more confident with the ball. He has had a great September playing (pickup games) with our guys. In terms of a guy on the roster making a jump, he's the one. Where that lands him in terms of a spot in the rotation remains to be seen. But he is gifted, and it's starting to click for him." Asked a similar question, Lillard pinpointed veteran big man Leonard. "Meyers has looked pretty good the past few weeks," Lillard says. "I say that every (Media Day) about Meyers, but this time is a little bit different. He was challenging shots at the rim. He wasn't the loud Meyers, drawing attention to himself. He was just doing his job, making shots. He had a different energy about him." With Davis gone to Brooklyn, there is additional playing time to be had for another player besides Collins. That likely will be Leonard or Caleb Swanigan. "With Ed gone, there is more opportunity," Leonard says. "Terry had a good amount of trust in Ed. I hope to gain that type of trust this season and help our team win. I need to bring it every day in a consistent way, to allow people to know what they can expect from me on a daily basis." • Lillard always works hard in the offseason, but he allowed himself more down time this summer to be with his girlfriend, Kay'la Hanson, and their infant son, Damian Jr.
Only LeBron James, Giannis Antetokounmpo and Jimmy Butler averaged more minutes last season than Lillard (36.6). "I sat still more than in the past," he says. "I wasn't traveling as much. I spent a lot of time with my son and my family. Did a lot of stuff around Portland. The training was the same. I prepared hard for the season. But I relaxed, too, took care of my body. I was banged up toward the end of the season. I got all of that checked out, then got my body right." Olshey says he had six players on his free-agency pursuit list for the mid-level exception this summer, "and we got outbid for all of them." • McCollum was asked what it will take for him to make the All-Star Game this season. "I need to average 1 1/2 more assists and a half less of a turnover, and we have to win 50 games. We need to be a top-five, top-six team in the West at the All-Star break," he said. McCollum averaged 3.4 assists and nearly two turnovers per game last season. Upgrading to about five assists, he says, is "just making the right pass one more time a game." It might be more difficult than McCollum thinks. Stotts says with the addition of Curry, he expects McCollum to spend less time at point guard when Lillard is out of the game. "I don't see him as having the responsibility initiating the offense quite as much," the coach says. • The Blazers were 14-21 heading into January in the 2016-17 season and 22-21 in mid-January last season. Stotts says he will try to impress upon his players the urgency of getting off a season to a good start. Part of that, both McCollum and Harkless mention, is beating teams they are supposed to beat. "We left a lot of games out there," McCollum says. "We stole a lot of games, but gave a lot of games away. Playoff teams don't lose games they're supposed to win." • On Sunday, McCollum proposed to his longtime girlfriend, Elise Esposito. "This is the best September I've had," McCollum quipped. "(Cleveland) Browns win, get engaged, 27th birthday." • It will be a learning year for Portland's rookies, 19-year-olds Simons and Trent Jr.
"I'm really excited about both the young guys," Stotts says. "They're very talented offensive players in different ways. I'm not going to go out on the limb and say how they fit in. When the opportunity comes for them, we'll see if they're ready for it." • Portland was last in the NBA in assists per game last season. Stotts says he is not sure what the reason was. "Some of it was poor shooting, inside and outside," he says. "We'll try to improve on that this year by shooting less off the dribble, using more movement and getting better shots." • Lillard says it will be good to face the Lakers in the season opener, as James is getting acclimated to new surroundings. "He is going to make them a lot better," Lillard says. "He's the best player in the world, but it's going to take time. They have a lot of young players. They'll be good, but any time you bring guys in to join a young team, a new team, it takes time to jell, to learn how to win together. It's good that we get them early."